You’ve taken your DNA test for genealogy and anxiously waited for your results. When they arrive, you dive into the ethnicity pie chart. 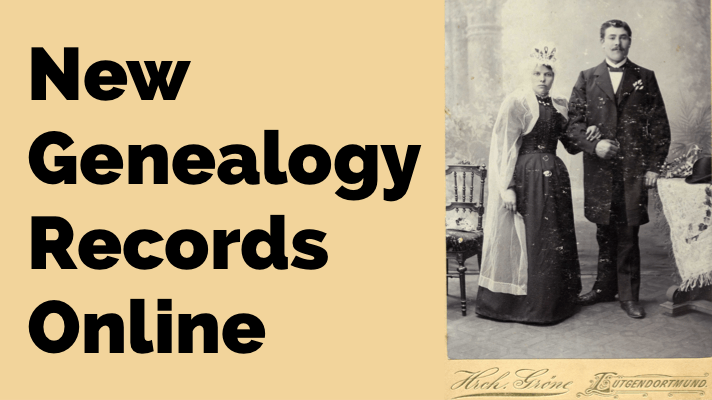 Then matches start rolling in and it can become a little overwhelming to make sense of it all and the benefit it can provide to your genealogy. Thankfully the DNA testing companies are not only focused on advances in testing, but also in creating tools that make it easier for you to interpret and use your results. MyHeritage DNA continues to release improvements to their DNA product that are meant to both enhance our experience with their website and make it easier to do our genetic genealogy work. You’ll also find an improved presentation of your genetic information that makes it easier to share with your relatives. 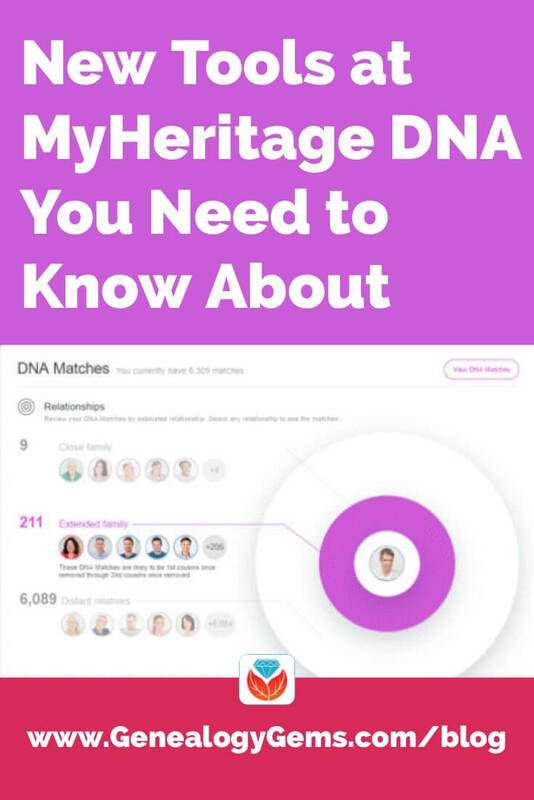 Just recently MyHeritage DNA announced the addition of new filters for their match page and a bit of a redesign. The small redesign includes moving the ethnicity estimate into a tab right next to the DNA matches tab, as well as adding an Overview tab. For any relatives who you have convinced to test, but who only show a passing interest in the actual genetic genealogy research, this Overview tab is a great way to show them their results without overwhelming them. There is a simple rundown of the ethnicity results, and then matches are broken up by relationship level and location. It is this location feature that will most interest the casual investigator, as well as the serious researcher. This filter lets you see the current location (note: NOT the birth location, though according to the MyHeritage blog post they plan to add birth location in a future update) of your DNA matches. Now, of course, this isn’t an active GPS that is spying on your match, but this tool relies on the location that your match has listed as their location in their MyHeritage account. First, it is interesting just to scroll through all of the listed countries and see the variety of locations where your DNA is currently residing. Just think about that for a second: If you are DNA matching with someone in Germany, that means that you are sharing some exact pieces of DNA with someone in Germany and a little bit of you is actually there. This can make for a fascinating exercise when you compare this list of match locations to the locations listed in your ethnicity results. Remember that your ethnicity results can represent your ancestral locations recently, or a very long time ago. So if you see locations on your match list that also appear in your ethnicity results, this might be a good indication that the overlapping location might actually belong in your genealogy. Or the absence of overlap might help you weed out those ethnicities that were thousands of years ago. For example, if you see that your ethnicity results list you as 2% Greek, but you don’t have any DNA matches in Greece, this could mean that your connection to this location is before genealogical time. Of course, it could also mean that the right people from Greece haven’t tested yet, so don’t get too caught up in these deductions. The last section in the Overview, and the last filter for your match list, shows you how many of your matches are reporting at least 10% of various ethnicities. 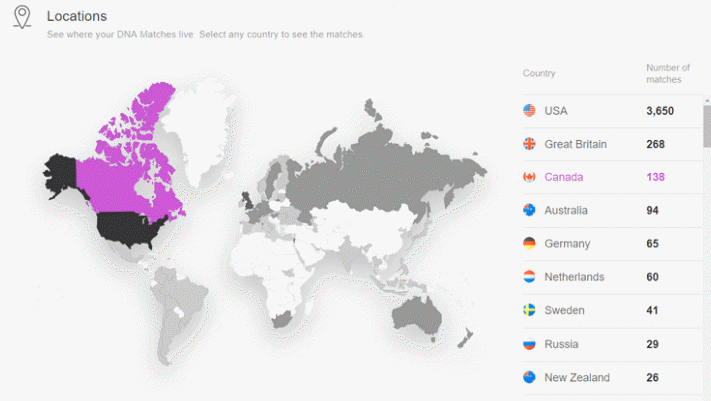 This might be helpful if you are working your Irish lines, as you can click on Irish, Scottish, and Welsh and see all of your DNA matches who report at least 10% in the Irish, Scottish, and Welsh category. Another powerful way to use the filters at MyHeritage is to combine them. On the main match page, you can click on two different filters to further refine your results. So perhaps if you are looking for your Irish ancestor, you might click on the Irish location filter, and then also on the Irish, Scottish, and Welsh ethnicity filter. This will give you all your matches who currently live in Ireland, and who score at least 10% in the Irish, Scottish, and Welsh category. Of course, the matches that show up after all the filtering aren’t necessarily worth your time or attention. Begin by taking a quick look at how much shared DNA you have. 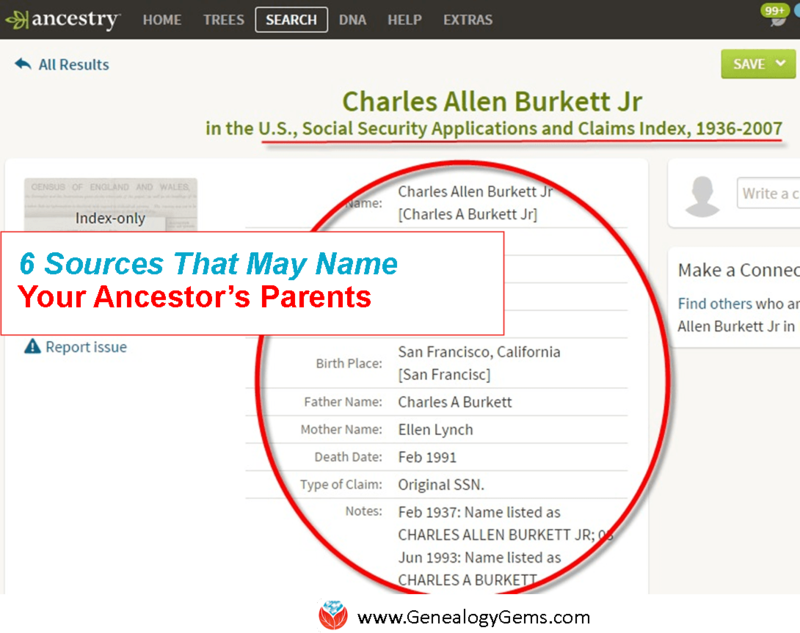 You will want to be sure that you share at least 20 cM before you go spending too much time scouring their pedigree charts for evidence of a shared ancestor. Likely these filters will continue to improve over time. One thing I would like to see is the ability to use the relationship filter to isolate third cousins, instead of always lumping them with the distant cousins. Most of us don’t have very mysteries in the Extended Family (1st cousins once removed – 2nd cousins once removed) category, so I personally don’t find this filter to be very useful. I would like to see them allow us to filter our best third and fourth cousins out from the rest of our distant matches. Hopefully, MyHeritage can make some refinements in those categories, and thereby make their powerful idea of a two-pronged filter even more effective. Stay tuned to the Genealogy Gems blog where you will hear updates about MyHeritage DNA (and other DNA testing companies) as they are announced. If you want help in getting more from your DNA test results and using the powerful tools at MyHeritage, my new quick reference guide MyHeritage DNA is available alone or bundled with other DNA resources at the Genealogy Gems store here. Premium eLearning Members can watch the Premium Video Get the Most our of MyHeritage DNA (and download the exclusive handout!) in the Premium Video section here at Genealogy Gems (subscription and sign in required). What’s your experience using these tools at MyHeritage DNA? Please join the conversation and leave a comment below. About the Author: Diahan Southard has worked with the Sorenson Molecular Genealogy Foundation, and has been in the genetic genealogy industry since it has been an industry. She holds a degree in Microbiology and her creative side helps her break the science up into delicious bite-sized pieces for you. She’s the author of a full series of DNA guides for genealogists. Well you kept me up an extra hour playing with the new filters. What fun! THANKS MyHeritage, you guys are the best!! Now if we could only get Ancestry to give us 1/10 of that. Even the Chromosome # and the cM length with location Hide it in the pop-up window with the shared amount they have now. Only those in-the-know would find it I would only whimper about not having a real Chromosome Browser. That’s awesome, and you’re welcome! Thanks very much for this, I hadn’t seen these new filters. Regarding the comment to “be sure that you share at least 20 cM” before spending time looking for the common ancestor, do you mean “longest segment of at least 20 cM” or a total (of all segments) of at least 20 cM? Based on work by Blaine Bettinger, I don’t look at anyone who doesn’t have a longest segment of at least 15 cM. I’m wondering if your recommendation pertains to total cM or if you’re like Blaine but just using 20 as your minimum for longest segment instead of 15.